Nearly 70 former federal and state judges are asking U.S. Immigration and Customs Enforcement to stop making arrests at courthouses. The judges’ Dec. 12 letter asks ICE to add courthouses to its lists of sensitive locations where arrests are barred, report NPR, Courthouse News Service and the Associated Press. Judges who signed the letter include 25 former state supreme court justices. “Judges simply cannot do their jobs—and our justice system cannot function effectively—if victims, defendants, witnesses and family members do not feel secure in accessing the courthouse,” the letter said. The Brennan Center for Justice at New York University School of Law helped coordinate the letter, according to a press release. ICE formalized its arrest policy in January. The ICE directive authorizes courthouse arrests of immigrants in the country illegally who are gang members, have criminal records, pose public safety threats, have failed to comply with removal orders, or have been previously deported. But the policy says arrests should be avoided in areas of courthouses that are dedicated to noncriminal proceedings, and generally there should be no arrests of people visiting the courthouse as family members, friends and witnesses. The judges said the ICE policy is inadequate. “Fine-line distinctions, such as who is a target and which parts of the courthouse ICE will use for enforcement activities, will not restore the public’s confidence that it can safely access courts,” the letter said. 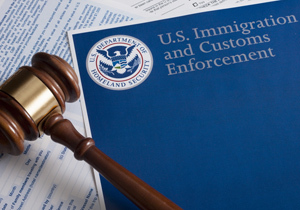 In August 2017, the ABA House of Delegates voted to urge ICE and U.S. Customs and Border Protection to treat courthouses as sensitive locations and to only conduct such arrests there “upon a showing of exigent circumstances and with prior approval of a designated supervisory official.” The Criminal Justice Section, Section of Litigation and Commission on Immigration and the Massachusetts Bar Association had introduced Resolution 10C, which was overwhelmingly approved by a voice vote. A representative from the Department of Homeland Security, which oversees ICE, didn’t respond to a request for comment by Courthouse News Service. But U.S. Attorney Andrew Lelling of Massachusetts defended ICE in a press conference hosted after the Boston Globe reported on a Newton judge who is reportedly under investigation, according to a story by MassLive.com. The judge appeared to continue a case to allow the defendant to avoid ICE arrest in April, the Boston Globe had reported. Lelling said ICE guidelines on courthouse arrests “actually are far more strict than people think they are,” and it is not common for ICE agents to make courthouse arrests. Lelling said there hasn’t been a chilling effect on immigrants’ cooperation with law enforcement because they already are hesitant. The People Have Spoken, They Want Weed! For more than 30 years, the Law Office of Richard J. Kaufman has been one of the preeminent law firms in Suffolk County, New York and has provided high-quality and affordable legal representation to individuals, families and businesses regarding all aspects of criminal law and civil matters.